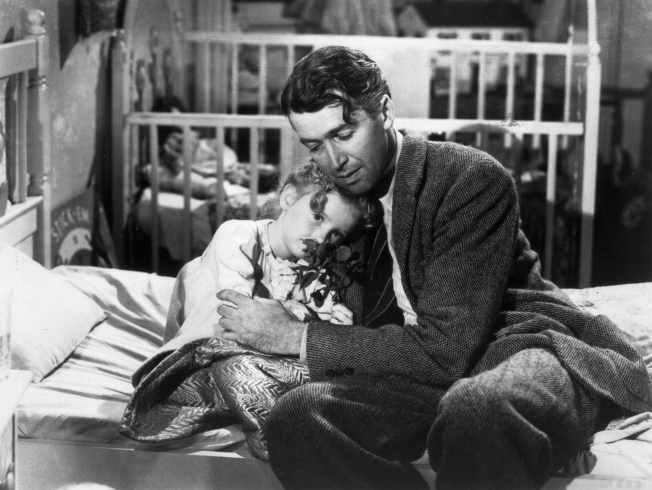 1946: American actor James Stewart (1908 - 1997) as George Bailey, hugs actor Karolyn Grimes, who plays Zuzu his daughter, in a still from director Frank Capra's Christmas classic film, 'It's a Wonderful Life'. The Jimmy Stewart Museum needs a George Bailey moment. It needs a community of good-hearted people who revere all that’s good about Hollywood to dance in with baskets of cash to save it from a dreary Pottersville of a future with shuttered windows and sidewalks of scowling strangers. It needs a Sam Wainwright to wire it a line of credit to ensure future generations of Americans won’t forget about a Yankee Doodle Dandy whose charm and patriotism still resonate. Similar hardships have closed the doors at museums dedicated to other icons whose once-gleaming luminescence has begun to fade with age. The Liberace Museum in Las Vegas, dedicated to the flamboyant ivory tickler, closed its doors in October after 31 years. And a museum dedicated to Roy Rogers and Dale Evans rode off into the sunset at the end of 2009. Harley says attendance at the Jimmy Stewart Museum has steadily declined in the past three years in concert with the struggling economy and as Stewart's contemporaries withdraw from bus tour participation. Harley is the museum's only full-time employee. Penny Perman of the Indiana County Tourism Bureau says the namesake museum adds about $407,000 in tourist dollars to the local economy. More than money, it stamps the region with engaging personality. Onscreen, Stewart portrayed a series of indelible American characters from George Bailey to Elwood P. Dowd in “Harvey” to a young idealist named Mr. Jefferson Smith who went to Washington and changed a cynical political culture (well, for a while, at least). Offscreen, Stewart was a real-life Boy Scout, a war hero, a father and a consummate gentleman. The five-time best actor nominee was born in Indiana, Pa., on May 20, 1908. His father owned the local hardware store in a building that today is across the street from the museum honoring his son. The hardware store was a local curiosity because it was where Stewart displayed the 1940 best actor Oscar he won for “The Philadelphia Story.” Customers admired it there next to the cash register when they paid for things like hammers and plumbing supplies. A Boy Scout whose memory is still honored by The Boy Scout Jimmy Stewart Good Citizen Award, he graduated from Princeton University in 1932 and was soon commiserating about the difficulties of Broadway auditions with his tenement roommate, another eventual icon, Henry Fonda. The success of “Mr. Smith Goes to Washington” (1939) and “The Philadelphia Story” (1940) made him a star and brought with it all the perks of fame — including an opportunity to duck duty in World War II. Not Stewart, an avid aviator who’d earned his pilot’s license in 1935. True to his word and displaying a puckish sense of humor, he still dutifully forked over a percentage of the monthly stipend to his agent back in Hollywood. George Bailey was a chagrined 4-F, ineligible for service, but Jimmy Stewart the bomber pilot was more like four stars. He flew 20 combat missions, was awarded six battle stars and in 1945 returned home a full colonel. He refused his military pension and donated it all back to the government. He remained active in the Air Force Reserve and retired in 1968 as a Brigadier General and earning the Distinguished Service Medal. At age 41 he married Gloria Hatrick McLean, already a mother to sons, Ronald, 5, and Michael, 3. Fraternal twin sisters, Judy and Kelly, were celebrated in 1951. The family enjoyed a comfortable life at 918 North Roxbury in Beverly Hills. They tended an ample vegetable garden and shared the fresh bounty with neighbors Lucille Ball, Jack Benny and Rosemary Clooney. One of the museum’s most cherished exhibits is the actual front door from the home, sold and demolished after Stewart’s death in 1997 at age 89. Visitors peek through the door’s peephole and imagine what it was like to see frequent guests such as Stewart friends Ronald Reagan, Bob Hope, Johnny Carson and Gregory Peck standing outside. “Growing up there made you not want to grow up,” daughter Kelly Stewart Harcourt is quoted as saying. The museum shows a life imbued with joy on- and offscreen. Museum board member Pauline Simms says the people today look at the exhibits, recall the movies and marvel at a man so talented and, gosh, just so darn normal. “The one comment we hear most of all is, ‘They just don’t make ‘em like him any more,” she says. It’s true. It’s impossible to imagine Stewart bouncing up and down on Oprah’s couch. He eventually expressed his life’s love in a much more poignant and profound way. Admission’s certainly affordable: Adults are $7; Seniors and service personnel, $6; children (17-7) $5. And, hey, Pookas are free! That’s a nod to Harvey, the 6-foot-3 invisible rabbit, who co-starred with Stewart on stage and in the 1950 film adaptation. Stewart says it was his favorite role. At heart, it’s a story about a man so pleasant, so utterly charming, and so devoted to the well-being of his every fellow man that the busy world is convinced he must be insane. Remove lunacy from the equation and sounds like the man who played opposite the big pooka. It’s a wonderful life. It deserves a wonderful museum.